The term “mobile commerce” is commonly used to describe e-commerce revenue that is generated over smartphones and tablets. But Flurry, a mobile analytics company, is introducing the term “app & mortar” in a new report published today that explores the rise in smartphone shopping. Clearly, the term is a play on the term “bricks and clicks,” which emerged in the late ’90s and became popular as e-commerce started to challenge physical retailers. In some respects, this report confirms what we already knew about mobile commerce, but takes it a step further by figuring out who is benefiting the most right now from the trend. Surprisingly, it’s physical retailers. 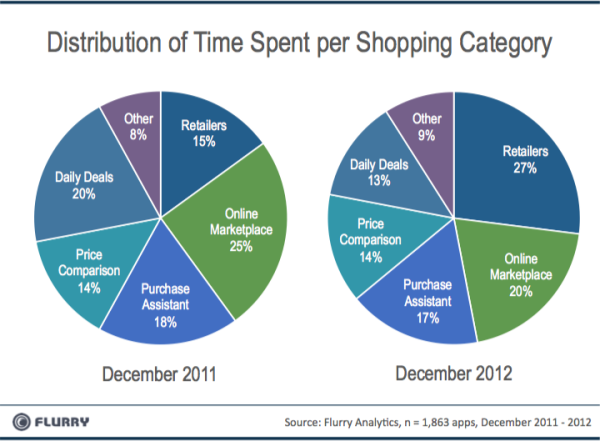 In the report, Flurry analyzed the amount of time spent by consumers across more than 1,800 iOS and Android shopping apps in December 2012, compared to the same month a year earlier. The biggest growth category by far was apps developed by retailers, such as Walmart, Macy’s and Gap. 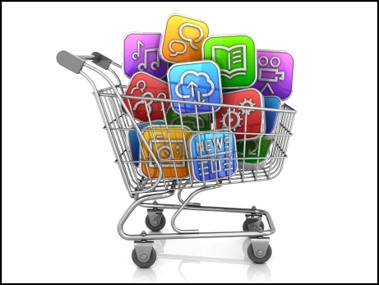 Flurry said time spent in retail apps skyrocketed by 525 percent year over year. In contrast, online marketplaces, such as eBay and Amazon, increased by only 178 percent. In terms of the share of shoppers’ time being spent inside the different apps, retailers also saw the biggest gains. In December 2012, shoppers spent 27 percent of their time inside of retail apps, up by 12 percentage points over the same month a year earlier. The gain in share by retail apps came at the expense of online marketplace and daily deal apps, which declined year over year. The share of time being spent with online marketplaces decreased from 25 percent in December 2011 to 20 percent in December 2012. Daily deal providers, like Groupon and LivingSocial, fell to 13 percent from 20 percent. Flurry did not offer a lot of analysis as to why this was occurring, but suggested that retailers were beginning to better respond to the move toward “online meeting offline shopping through mobile apps.” In general, 2012 was the first year that many online or physical retailers took mobile shopping seriously, so it was likely that the distribution of time spent would change with a huge surge in consumer interest and better options. Interestingly, even though Flurry noted a decrease in time spent in online marketplace apps, eBay still easily beat its mobile revenue forecast (so it’s not clear if there’s a direct correlation between time spent and dollars spent). Last week, eBay said it recorded $13 billion in mobile revenue in 2012, exceeding its forecast of $10 billion. This year, the online retailer expects mobile revenue to hit $20 billion. EBay is the most transparent of the larger e-commerce players when it comes to mobile’s contribution. In contrast, an analyst’s best guess for Amazon is that about $3 billion to $5 billion of its annual sales are coming from mobile devices.